Site by eTree Enterprises, LLC. Purchase the Bliss package for Mother’s day pay only $145 for a classical facial and back massage or treat Mum to a Pure Fiji Sugar Glow body treatment only $90 every Mum needs some special time out! Gift voucher can be purchased directly on the website or call into clinic. We also have plenty of gift packs instore from $40. We have exciting news welcome Adele Van Veen to the Pure Essence team! she is our new apprentice. As an introduction to Adele she will be doing Pure Fiji rituals at a special price the Rituals are Foot or Hand Rituals where coconut milk bath is massaged into your skin. Sugar rub is then used to exfoliate. Once washed and dried, body butter is used to massage away all of life’s stresses leaving your skin hydrated and silky smooth. Mini Sugar Glow Ritual this is for your back perfect for after the summer months. Coconut Milk Bath Solution is drizzled and massaged onto the back, followed by a Sugar Rub application. The exfoliation from the Sugar Rub will rid the body of dead skin, revealing new healthy skin and replenishing moisture loss. Heavenly Hair Ritual ( my personal favourite!) Warm Pure Fiji Exotic Oil is drizzled and massaged gently into the scalp and neck restoring balance and leaving the hair healthy and shiny. Mini Hydrating Wraps for hands or feet a warmed body butter mask is applied and wrapped to your feet or hands to deeply nourish dry skin followed by a relaxation massage. Each treatment will cost only $25 you can book them online or ph us 4320890 Waipu clinic only Thursday, Friday and Saturdays. 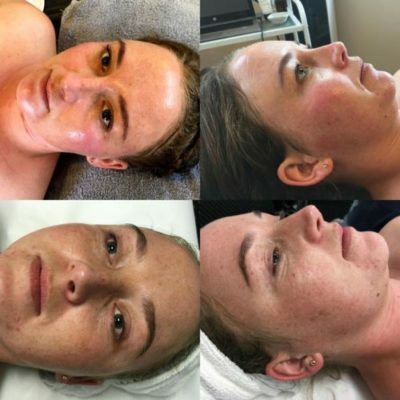 Call us for a skin assessment and consultation if you are wanting to get real results for your skin we have been doing paramedical skin revision with DMK Danne enzyme therapy and remoulding peel procudures. 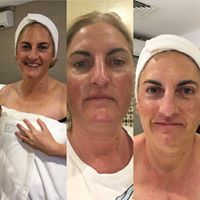 The results are truely amazing below are before and after photos of myself Alex and Rebecca the before photo was on the day of the peel and the after photo was only 9 days later! 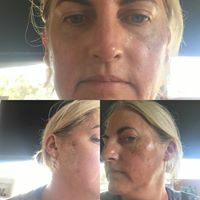 Your consultation will take 30mins it will cost $50 which is then redeamable on product purchase or you can use it towards your first enzyme treatment making your consultation free! Here are photos taken from day 1-10 for a RP peel I have had in March this year. 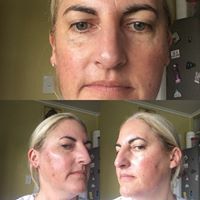 comparing day 1 photo along side day 10 photo amazing results less lines, smoother skin and reduction in pigment! 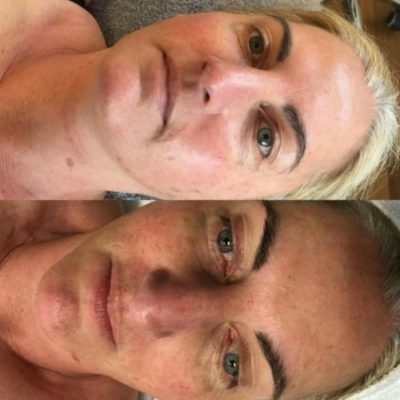 Not all neddling is the same, the rollers we use are medsafe approved and have been independantly tested to prove that they promote new collagen growth, reduce pore size and stimulate cell renewal. They have tappered neddles to reduce damage to your skin. 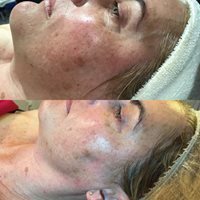 We have been doing Collagen Induction treatments with Dermaquest needling treatments for a while now and can really see the benefits. 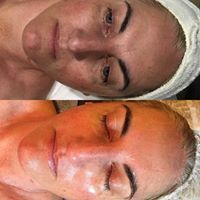 This wonderful treatment allows your skin to produce new collagen a must for anyone concerned with ageing. We are loving the long term benefits that this is giving to our clients. To learn more about this book a consultation with Alex. Medsafe approved. We are super excited to annouce that we are now Pure Fiji stockists! Pure Fiji signature treatments “Sugar glow” & “Island re hydrating body wrap” Are now available. sugar cane harvested from the sun drench plantations of Fiji combined with the exotic tropical nut oils and fruit enzymes nourish skin with vitamins A,B,C and E to create the ultimate healthy glow. Relax and enjoy as milk from the coconut combined with macadamia and coconut oil are gently massaged into the skin followed by an application of pure cane sugar and tropical nut oils ridding the body of dead skin, revealing new healthy skin as well as strengthening the skins elasticity and replenishing moisture loss. treatment time 50Min’s. $90. Have a manicure with polish that lasts up to 3 weeks for only $50. Strengthens your nails, allows them to grow doesn’t chip and is easy to remove, try it you’ll be amazed. opi gelcolor is the only true gel with no normal nail polish added to the gel you will love the results. If you want something a little special add nail art to your look. We have increased our make up range , now we can be really creative! 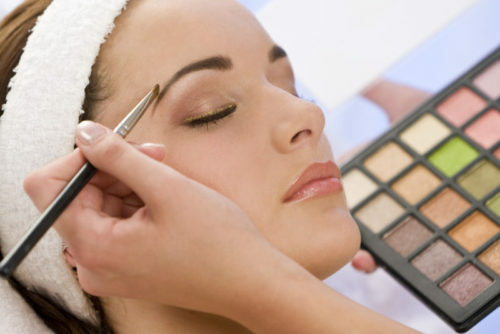 Let us help you create a new look, when you book in for any other treatment- tell us you also would like to try a new look and we will allow extra time to help you at no extra cost! GIFT VOUCHER IDEAS Buy a voucher for someone giving them the gift of relaxation and time! The perfect present, choose off the menu or make it to a $ value so they can choose what they would like. Buy it online or call into the clinic. 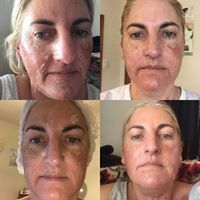 Interested in Skin revision at the cellular level book for a DMK skin consultation 30mins to assess and recomend a program to suit your budget and deliver real results, 30mins, cost is $50 which is refunded on product purchase or first enzyme skin treatment. 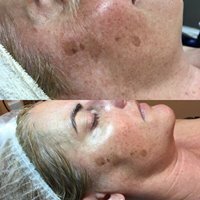 Learn all about your skin and the conditions you have. Get a group together of 6 or more friends and prepare to be pampered at your place! Best of all, as the organiser you will receive a FREE treatment.